I can’t remember the first time I saw them, but once I did, I noticed them everywhere. Entler Studio’s tentacle-like lamps have propagated across social media so much so that they’ve become one of the most-recognized pieces of decor in any given cool apartment. They’re quirky, sure, but something about them gives the viewer a pause. Is it the way the globed lamps almost envelop their light bulbs? Or the way the heads dropped just slightly, like a flower in need of water? Something about them unsettled me, but I couldn’t get enough. Evoking images of unbalanced antennae, Entler’s lamps are futuristic, even if the design does slightly harken back to curved, groovy late ’60s and early ’70s styles. Their appeal is vast (reflected in their growing popularity) and they’ve become one of the many pieces that might be styled in a distinctly contemporary space, making a more dynamic alternative to, say, a mid-century globe light. 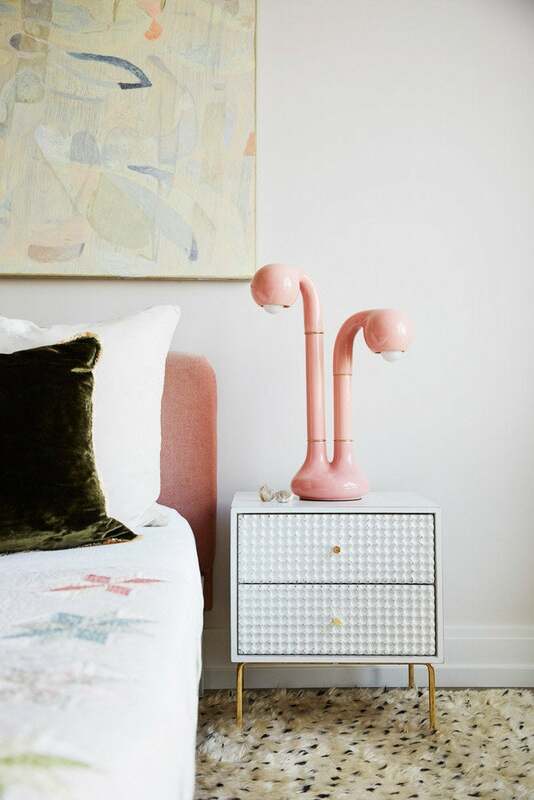 Available in a wide range of colors (including an irresistible pink), and featuring subtle brass accents, these lamps are certainly pretty, but they’re also just a little bit disconcerting. This is a kind of futurism that feels completely new. They aren’t suited in chrome or another industrial metal. They aren’t sleekly minimalist and they don’t evoke a Tron-like electric feel. Instead, they’re a blend of organic and alien, old and new, comforting and uncomfortable: In that, they’re distinct, and somehow, seemingly perfect for the world today. The 21st century has seen at least two major design movements thus far. In the first decade, economic abundance led to an era of indulgence: think, overly elaborate drapery, massive sectional couches, and dark wood accents that attempted, at least, to evoke antiques of earlier eras. By the 2010s, the minimalism craze coincided with lifestyle changes: People pared down, opted for lighter, brighter spaces, and looked to Scandinavian style for an answer to overcomplicated homes and lives. Now, there’s something new happening. The design world, of course, isn’t a monolith, and a single trend is never quite universally embraced, but now, there’s growing interest in decor that seemingly sits directly in between two diametric forces. Entler’s lamps are both cool and creepy. Light sculptures by Isamu Noguchi (first designed in 1951 and now enjoying a resurgence of popularity) strike a similar balance of alien and organic. Other sofas, chairs, and decor that contort into unexpected squiggles and amoeba-like shapes also offer a unique appeal that isn’t totally comforting. The future, to everyone, is unknown, and it could be possible that the best way to express our anxieties about that undeniable truth is through creations that are comfortable being uncomfortable. Now is a time for experimentation, exploration, and a step into unchartered waters—and it might just be that a lamp that looks flung out of space makes for the perfect thing to light the way. Are Millennials Reviving This “Outdated” Couch Style?